No special culinary equipment is required for this wonderful recipe from the north of Italy. Take 2 tablespoons of the butter and melt over medium heat in a large sauté pan along with the minced garlic. Add the collard greens and sauté for about 3 minutes. Add the kale and sauté for another 2 minutes. Add the spinach and sauté for 3 more minutes. We want to make sure that all of the greens are cooked and the liquid is released. Let the greens cool and then squeeze the liquid out of the greens by hand and pour out the liquid. Let the remaining greens sit over a colander to continue to drain any remaining liquid. After about 15 minutes, run the drained greens through a food processor by pulsing the processor two or three times. We want the greens coarse still. Again place in a colander and drain for a few more minutes. In a bowl, beat the eggs together and mix in the ricotta. Beat again. 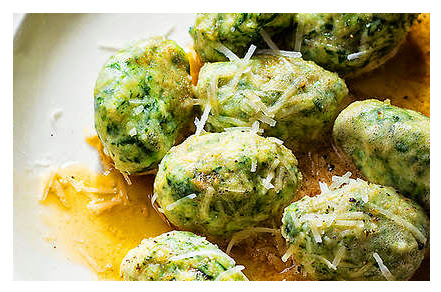 Mix in the flour, greens, nutmeg, and half the parmesan cheese. Add salt and pepper to taste. Put flour on your hands to make sure that the gnocchi do not stick, and then form the mixture into balls about ¾ to 1-inch round. Place them on a cookie sheet and put them in the refrigerator for about an hour. When it is time to cook the gnocchi, bring a large pot of water to a boil (5 to 6 quart pot). Add 2 tablespoons of salt to the water. Once the water is boiling, add 6 to 10 gnocchi to the water at a time. Once the water returns to a boil, cook the gnocchi for 3 to 4 minutes. Lift them out of the water and drain them, and place them gently into the serving bowl. “Dot” the gnocchi with a little butter to keep them moist. Sprinkle with a little parmesan cheese. Keep them warm while you are cooking the rest of the gnocchi. Continue cooking the gnocchi and repeat the process until all of the gnocchi is cooked. Melt the remaining butter in a small saucepan, and spoon over the cooked gnocchi. Sprinkle with the remaining parmesan cheese. Serve immediately.